The countdown clock to the 2014 EHF European Championship continues to tick down - as of October 2013 there will be a mere 100 days to go. Throwing-off this 'Where are they now? '-series is Swedish middle back Magnus Andersson who was voted Most Valuable Player at the 1994 EHF EURO in Portugal. Andersson was one of the legendary 'Bengan Boys', the fantastic Swedish national team under national coach Bengt Johansson, nicknamed 'Bengan', that won four European Championships (1994, 1998, 2000, 2002) and two World Championships (1990 and 1999) between 1990 and 2002. Today, 43-year-old Magnus Andersson coaches HK Malmö in Elitserien, the Swedish handball league, but of course he still remembers his time with the 'Bengan Boys' and in particular the first European Championship in history which took place in Portugal in 1994. Not only did Andersson, being the inventive playmaker he was, steer Sweden to the title. He was also awarded Most Valuable Player of the tournament, in which Sweden won all their matches, ending with a 34:21 final win against Russia. All in all, Andersson reached 307 internationals for Sweden. 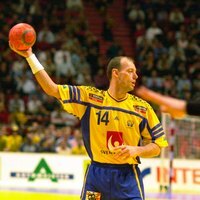 eurohandball.com talked to Magnus Andersson about then and now. eurohandball.com: What do you remember from the 1994 European Championship? Magnus Andersson: I remember us playing a really great tournament, where we played some really fine handball. We got some new players very well included during that tournament. Actually, Stefan Lövgren, who later became one of the big stars was one of them. I remember it as being ten great days in Portugal – and of course I remember the final in particular, as we beat Russia by 13 goals. We really played fantastic handball in that final. eurohandball.com: What did it mean to you to be awarded the tournament's MVP? Magnus Andersson: Of course, such a title always means something for your personal ego. It is always nice to be praised, but apart from that I was mainly focusing on the team and how well we did. However, I can say that I was very pleased with the team's performance as well as with myself in that tournament. eurohandball.com: What was so special about the 'Bengan Boys' – apart from consisting of some fabulous players? Magnus Andersson: It is funny that you ask that question exactly now, as Swedish TV I preparing a one-hour documentary on the 'Bengan Boys' which will be broadcast in connection with the EURO 2014 in January. I think part of our popularity was due to the fact that almost all the players went on playing in the national team for a very long time. For instance, I played my first international in 1988 and my last one in 2003. That makes a spell of 15 years, and the same holds true for many of the other players. This, combined with our fine results made the Swedish population identify themselves with us. In Sweden we are used to football and ice hockey being the most popular sports, but all of a sudden, handball was discovered to be fine TV entertainment, too. eurohandball.com: When talking about the 'Bengan Boys', people also talk about the title you never won: The Olympic gold medal. Does that missing Olympic gold bother you today? Magnus Andersson: No, not really. Out of the three Olympic finals we qualified for – 1992, 1996 and 2000 – it is only the 1996 final against Croatia which I see as a real failure for us. In 1992 and 2000 Russia were simply better than us. I really do not think about that missing gold any more, only when people ask me about it. eurohandball.com: After your playing career you became a coach. What have been your greatest moments from that part of your handball life so far? Magnus Andersson: It would be obvious to say that it was reaching the Champions League FINAL4 with AG København in 2012, and of course that experience and that whole year with AGK stands out as a great time. However, it was also great fun to come home to Sweden as Austrian national coach for the 2011 World Championship. Our results were not great, but still it was fun to come back to Sweden in that role. eurohandball.com: Today you are head coach for HK Malmö, playing in the Swedish league but without being a top club. What is that like for you? Magnus Andersson: Obviously, it is quite different from what I am used to, but it does not make that much of a difference to the way I am working. Besides, I had been away from Swedish handball for seven years before taking over in Malmö, and it is great to be back. eurohandball.com: Are we going to see you as coach at international top level again some day? Magnus Andersson: The ambition is still there, of course, although I am content in my current job. I really cannot say, when or if I return to coaching at top level, as that depends on quite a lot of thing, but considering what I have tried in my handball life so far, I would of course like to be coach at top level again some day.